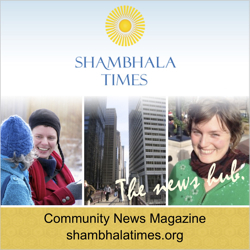 Within this April Shambhala Training II, there will be a unique subgroup designed for youth. Teens—share conversation and breaks with your peers! BSC has a partial grant to encourage and support teens in the Front Range area to gain a foundation in mindfulness-awareness meditation practice. If you know of a young person who would be a good fit, please tell them about this cool opportunity! This program is deeply discounted for folks 18 and under. No one will be turned away. Donations gratefully accepted. Please call Nicole Wolf at 917.570.9234 if you are coming from out of town—accommodations may be available Friday and Saturday nights in Boulder. If these pricing options are unworkable for you, we are happy to accept what you can offer, including volunteer service. Please contact Tracy Suchocki at [email protected] or call 303.444.0190, x104 at least three days in advance.